Here’s the newest development of the spring fork – Dial-Your-Ride. By a simple twist of the wrist, you can adjust the tension for light or heavy riding, or for smooth or bumpy roads. Dial-Your-Ride can be set instantly to give greater riding comfort for any size or weight rider and under every road condition. Made of extra-flex alloy-steel springs like those on fine automobiles. Adds to the life of the bike by better absorbing of road shocks and vibration under all conditions. In America in the early fifties, streamlined cars ruled the road and streamlined refrigerators ruled the kitchen. Early in the morning, the boy with the streamlined bicycle ruled the paper round. The Huffman Dial-Your-Ride not only had aerodynamic looks, but also sported a front fork that was bigger than any other bicycle on the road. In fact, I don’t think any other bicycle, before or since, has featured a front fork this large. Whether it made much difference to the quality of your ride was besides the point. …The point was that every other kid would want to dial your ride. Loosen spring and glide without vibration. Adjust spring for more speed, more comfort. Set spring for a looser, shock-absorbing, gliding ride. American bicycle manufacturers had suffered after the initial boom years ended in the first decade of the century; the automobile was a far more suitable means of transportation. Those who had not shifted to motorcycle or car production (or sold out or gone bust) now primarily made bicycles for children and young adults, which helped to create America’s large toy industry. Cuts you IN on America’s finest franchise; keeps all competitors OUT. Same deal available for aggressive distributors. The Toy Building at 200 Fifth Ave, NY, referred to in the Huffman trade advert above, recently celebrated its centenary. Until 2007 it housed the annual International Toy Fair. Many toy manufacturers had suites there to promote their merchandise, and used its prestigious address in their ads. Originally this location housed the Fifth Avenue Hotel, built between 1856 and 1859. 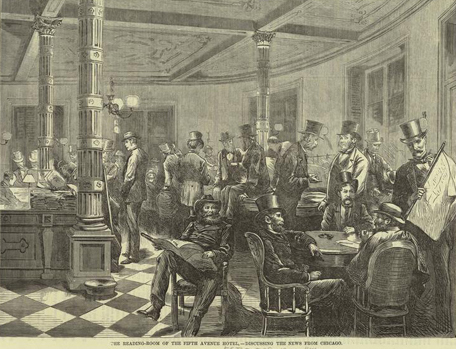 (New York’s first hotel opened in 1851). You can see the hotel’s reading room below. The Fifth Avenue Hotel was demolished in 1908, to be replaced by an office building. Toy firms started to move in during World War I, when European toy imports (mostly from Germany) were halted and America had to make its own toys. 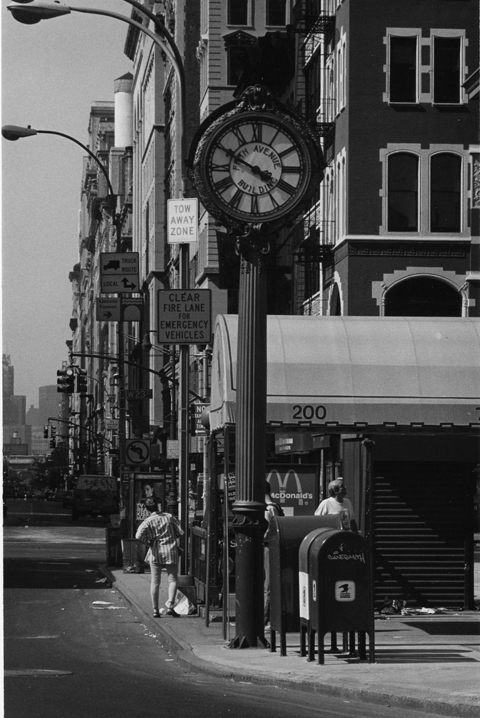 At the time, the Flatiron Building, located opposite, was in its prime, and the area was in great demand. It became the Toy Center in 1925. By World War 2, most toy manufacturers were represented there. It was obviously a boon for the small and specialist toy manufacturers who made up the majority. In its prime, the Toy Center included other local buildings, particularly 1107 Broadway. In 1967, a ninth-floor passageway bridge was built to connect the two buildings, providing a combined million square feet of space. An ironic point occasionally noted by newspapers is that the Toy Center did not welcome kids: it was purely a wholesale location that remained mostly empty until February each year when the International Toy Fair took place. New York Times, March 8, 1948: Eight hundred exhibitors will preview more than 100,000 toys to the trade in eight acres of exhibits at the American Toy Fair which is scheduled to open today in the McAlpin and Breslin Hotels and in permanent exhibits at 200 Fifth Avenue, 1107 Broadway and other buildings, under the auspices of the Toy Manufacturers of the U.S.A. The show will continue until March 20. To younger folks, the name ‘Huffy’ is not associated with quality. But, at one time, a Huffman was a bicycle to envy. The Dial-Your-Ride was one of the company’s last great bikes, from a golden era of bicycle design. The Davis Sewing Machine Company had survived 30 years in the bike industry, but were finished by 1922. Horace Huffman was put in charged of liquidating the companies machinery. He used the funds to create the Huffman Manufacturing Company in 1924. The remaining Davis bike inventory was sold through 1925. The Huffman company concentrated on non-bike products until 1928 when the Huffman Company incorporated for the purpose of building bikes. Work began on modernizing the Davis factory. line of bikes. They used many of the Davis names including Snell, National, LaFrance, Dixie Flyer and Dayton (for the top bikes only). New names that appeared included Zephyr, Airflyte, Davis Flyer as well as many private label brands. The Yale name had been transferred to the D.P. Harris Company. All Huffman bikes used balloon tires and “Aircrafted” frames. All joints were fillet brazed, then ground down and polished. (1, 2, 3 or 4), a higher number meaning more equipment. Huffman became the sole supplier for Firestone starting in 1935.
that the curved seat stays were introduced. 1936 introduced 0the D-44E Safety-Streamline. The frame featured a double rear fork sweeping behind the rear tire. A special horn and headlight combination was molded to the front of the head tube. The fender braces were replaced with bracing placed inside the fenders and attached directly to the frame or fork. rear fender. All of the wiring was contained inside the frame tube. The horn button was hidden in the end of the hand grip. Since the normal location of the head badge was covered by the horn/light combo, the head badge was moved to the front of the back fender. All the bikes were “sea Mist Green”. Six months later the bike was replaced with the D-44K “Super- Streamline”. truss rod fork and flat fender braces. The bike also had extra-long painted darts on the frame. The 1936 frames all had a necked-down area on the top three inches of the seat tube. For 1937 the Super-Streamline was available in two models. Both models had shorter frames since the original battery box was eliminated. The D-2E used the 1936 frame with a torpedo style headlight, a “Huffman Streamline Extended” gooseneck, new style rear reflector and gothic style fenders. The rear stands attached to the frame instead of the rear axle. A short mesh-like chain guard replaced the previous years extra long unit. The Dayton and National bikes were chromed and the Huffman bikes used painted chain guards. The new pedals were of a streamlined teardrop shape. The second model D-1T used a slightly modified frame. It used a 3-ribbed “Zephyr” tank with a horn button. Dual “twinlites” were also part of the package. The owner could use four “D” cell batteries or a “409″ size battery in the tank. A unique feature was a cast aluminum speedometer housing that fit over the extended stem. It was know as the Dayton “ashtray” and housed either a Stewart/Warner or Walthan speedometer. The 1937 Dayton line offered 16 models and the Huffman line consisted of 22 models. There was a new camel back frame with a single top tube in addition to the Standard Motorbike with the conventional frame. An economy version, the 6-T, was available with a camelback frame, hanging tank and aluminum headlight. The lightweight line for 1937 was available as the Model #16 with drop bars, 28″ tires, aluminum fenders, chrome-moly frame, rat-trap pedals and solid rear hub. The model #17 featured an upright bar and coaster brake. without tank, rack, light or chain guard. After the bikes were shipped, it became obvious that the frames would break under normal use. Huffman Incorporated created a total recall of the bikes. The recall was so complete that a 1938 Twin-Flex had not been found until 1998. The Twin-Flex became known as the “Death Bike” because of the demise of the model and the troubles it caused the company. Because of the Twin-Flex problems, Firestone decided not to rely on one supplier and gave much of their account to the Colson Corporation. The Twin-Flex was re-introduced in April 1938 as a 1939 model. The suspension was redesigned using a single spring for each wheel. This model had a straight down tube for a month before it was changed to the double curved tube. In 1939 Huffman designers replaced the top tube on the 51-X with a Zephyr-looking “tank” that was made into he frame. The base model was without accessories. Firestone offered the same model with all the accessories named the “Flying Ace”. When the Firestone bikes had a chain guard the guard used three embossed speed lines instead of the curved ones found on the Huffman branded bikes. Some Firestones had a place for the owner’s initials on the front fender. Any model could be accessorized. chrome twin lights $.80, horn tank $1.95, Twin Flex cushioning on any Dayton model $4.00. 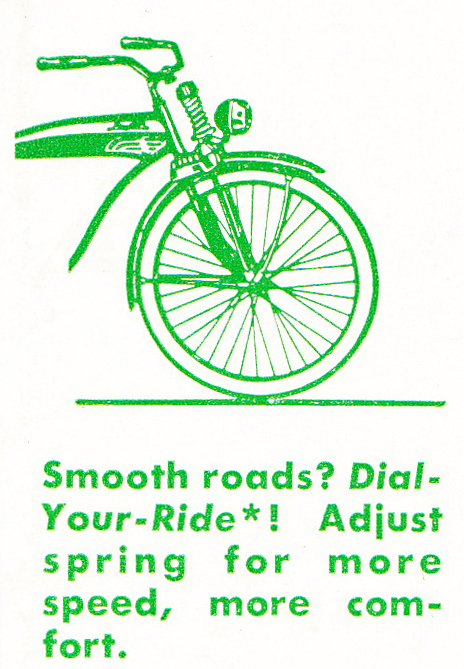 1939 saw hand brakes and Sturmey-Archer 3-speed available on the lightweight models. 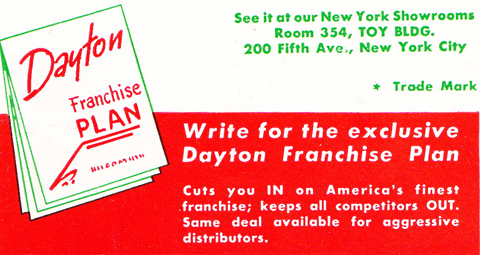 The Dayton line featured the Mainliner for 1940 while Huffman had the Champion. Both bikes had a tank that wrapped around the front of the head tube, two teardrop lights on either side of the tank, and a chrome plated grill in place of the head badge. The Mainliner featured a lighted luggage carrier and new chainguard. The extra-deep fenders had a chrome plated ornament on both models. The Huffman Top Flite had the tank without the built-in headlights and a stainless steel nosepiece instead of the front grill. Most 1940 models had a gracefully curved down tube. “Safetee Kick Stand” side stands replaced the old style center stands. For this year only, the frame had a welded-on kick stand with an “H” head bolt. 1940 was the last year for the Twin-Flex, model 21-TF, which was available by special order only. 1941 was the last year of production prior to the war. It was also the last year for the extra-long tank that wrapped around the head tube. The top models featured a new springer fork that was similar in style to the Schwinn fork. The dual lights were replaced with a single large chrome headlight in front of the fork. The Huffman Top Flight came with chrome struts instead of the spring fork and a less deluxe carrier. The 1941 bikes also had fake molded springs on the seats even including fake molded nuts. The budget bike from Huffman were the Deluxe Line. The tank did not wrap around the head tube but it did have the same spring fork and substituted a front load Delta torpedo light on the fender. 1942 brought the Civilian Transport models with simple diamond frames, no ornamentation and painted parts. Huffman and Westfield Mfg. were chosen to produce a GI bicycle. The standard balloon tire “Universal Military Bicycle” and women’s military bike (M306) used standard interchangeable parts for both manufacturers. All bikes were painted olive drab and had a leather seat, small air pump, seat-mounted tool kit, coaster brake, handlebar bell, fenders, chainguard and Delta Winner fender light. The bikes were used at every camp in the U.S. and most overseas facilities that were not at the front. By the 1950’s most of the bikes had been sold for scrap and are hard to find these days. In 1942 Horace “Huffy” Huffman was named president of the company. In 1943 civilians could qualify for a bike if they could show a “need” for one. 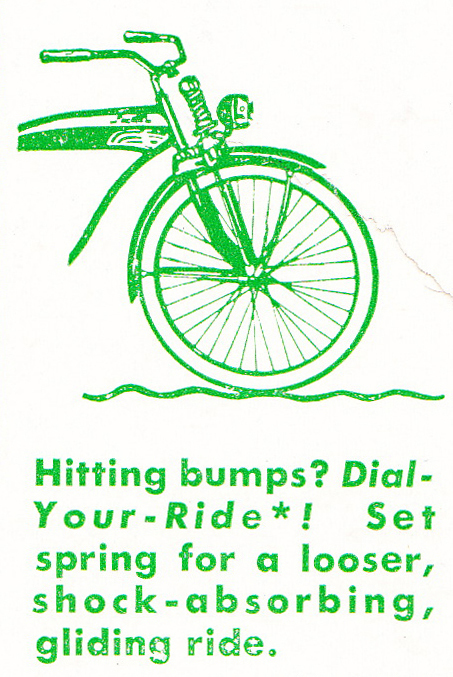 1946 brought a rush of pent-up demand for bikes. 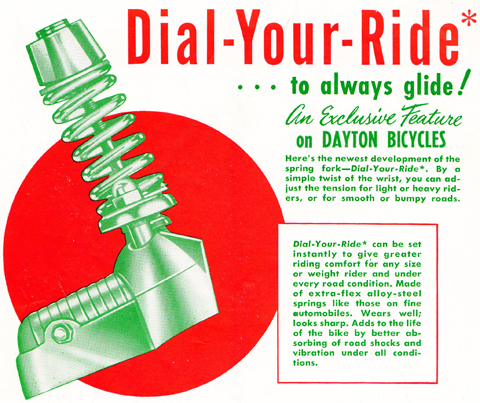 The Champion line featured the 1941 style spring fork that was now known as the Gliding Ride spring fork. The “Deluxe Special” line of bikes didn’t have the springer, but they did have the tanks and carriers. The “Special” bikes had no accessories. 20″ and 24″ bikes were available. These bikes used the same chain guard as the pre-war bikes without the grilled nose. The louvered tank found on the less expensive 1941 models was now attached to the top models. The Deluxe line had a large dart painted on the tank that matched those on the frame. On May 13, 1947 the 1 millionth bike was made. The 14K gold and chrome plated bike was sent to the Henry Ford Museum in Dearborn, MI where it remains today. 1948 brought entirely new models from top to bottom. The Champion include a new tank, carrier and full length chain guard. The frame was slightly redesigned and a new “Streamlite” headlight that followed the fender contour. Auto style chrome trim was added to the tank, carrier and chain guard. The Deluxe Special came without the chrome trim, a new chain guard and Delta torpedo light. The new carrier attached directly to the rear fender with no additional braces. The fender braces had a gentle curve to them. Huffman improved the chain adjusters to use lock nut installed in the frame. If there was a problem this made it much easier to fix than the adjusters that were tapped into the frame. The Model 90 was made for the Whizzer motor. It had a slightly modified frame, notched rear fender, and a special crank to clear the belt guard. A Morrow rear brake and New Departure front brake were used for stopping and .120 gauge spokes were used for extra strength. or paint finishes. The rims held more air due to their shape and were supposed to give a better ride. More chrome was added to small parts such as lock washers. The 1949 Champion used a Delta Road-liter instead of the Streamlite. 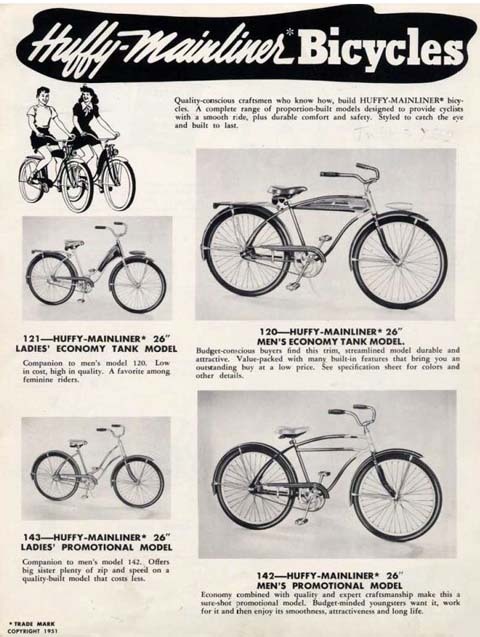 The Huffy name was used for the first time in 1949 on a new “convertible” model. 20″ and 24″ Huffy models were soon added. 1950 found the Huffy name added to an electric mower. 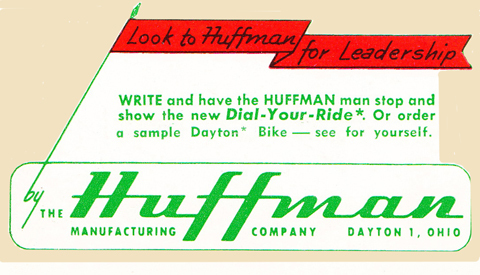 Huffman bikes introduced the “Dial-Your-Ride” fork in 1950. The large fork had an adjustable knob on the top of the spring to adjust the spring tension. 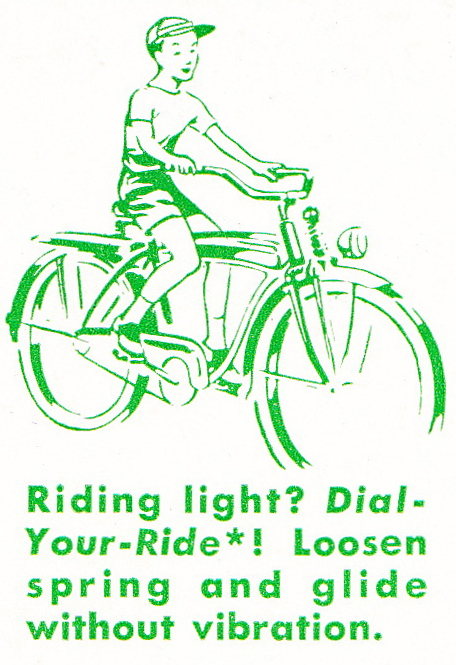 The torpedo style light was replaced by a larger ball-type light that mounted on the front fork. 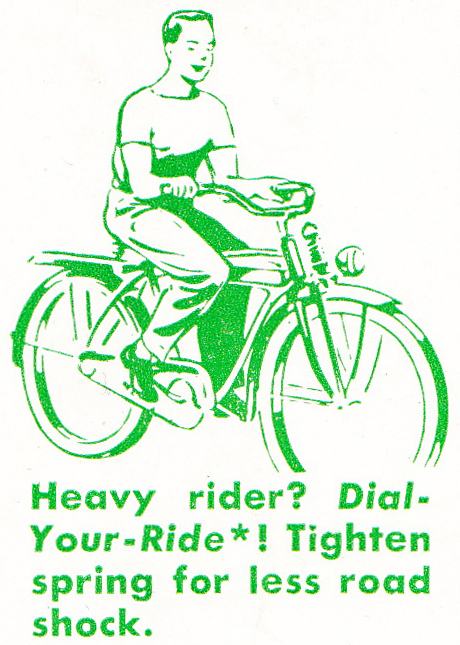 Bikes in 1950 or 1951 were the last to use the Dayton name badge. Below, you can compare the company’s mainstream range for 1951. Note that the name was no longer Huffman, but Huffy. It wasn’t only bicycle manufacturers who were striving for something different to interest customers. Hobbyists have always been keen to experiment with what they could buy and turn it into something unique. 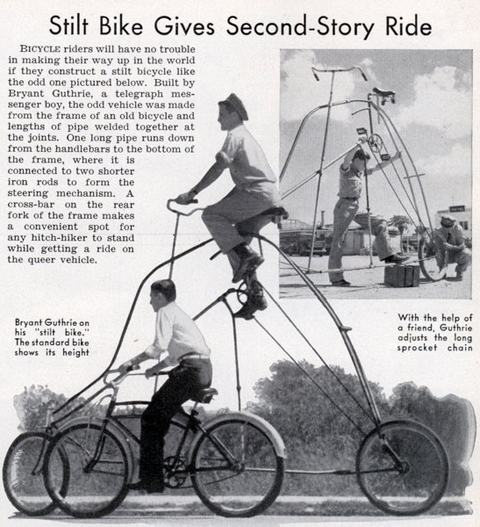 Popular Science magazine featured many interesting inventions and innovations, and the issue of February 1940 illustrated a particularly over-the-top example. Bicycle riders will have no trouble in making their way up in the world if they construct a stilt bicycle like the odd one pictured above. Built by Bryant Guthrie, a telegraph messenger boy, the odd vehicle was made from the frame of an old bicycle and lengths of pipe welded together at the joints. One long pipe runs down from the handlebars to the bottom of the frame, where it is connected to two shorter iron rods to form the steering mechanism. A cross-bar on the rear fork of the frame makes a convenient spot for any hitch-hiker to stand while getting a ride on the queer vehicle.